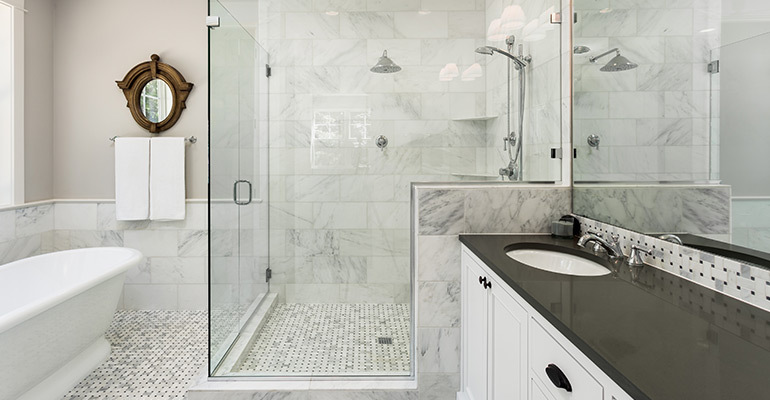 Appearance is not the only thing you need to think about when choosing between a shower curtain or glass enclosure for your bathroom renovation. Some other factors you need to consider are: functionality, personal maintenance, budget and long-term plans. Shower curtains have the benefit of being able to hide messy baths, or alternatively reveal your beautiful porcelain. Shower curtains when left outside of the bathtub do drip onto the floor, which is a serious consideration especially for small bathroom renovations as stepping in water can get annoying as well as messy. If deciding to go with a shower curtain for your bathroom renovation it is important to make sure that the curtain is non-PVC (polyvinyl chloride) as it is extremely hazardous to your health and the environment. The type of material you choose can effect not only the look, but its functionality as well. For example, hemp is great for its natural resistance to mold and mildew. One of the major benefits in having a shower door/glass enclosure is that they are made from safety tempered or laminated glass, allowing for with minimal maintenance with years of durability. Many feel as though this makes up for the added expense, as glass enclosures can be kept new-looking for years. Frameless glass enclosures are becoming more and more popular for their elegant look, as well as that they add a feeling of grand space with their open-style bathroom design. Though they have an extra cost this choice will add value to your home. Like the kitchen, bathrooms are one of the most frequently used rooms in your home. It is important that it gets the attention that it needs in order to make it a relaxing, clean and welcoming space. Not only to add value to your home, but to add value to your life. Correctly renovating your bathroom can make an incredible impact on your house and the choice between a shower curtain or glass enclosure is a big part of that. Complete Bathroom Renovations can you help you select the right look for your space, and their team of bathroom renovation experts can offer advice and answer any questions you may have. Give them a call to speak to them about the perfect bathroom renovation for your home.